From Guy's Hospital in London to the Sanger Centre and Illumina, David Bentley has seen clinical genomics come full circle. David Bentley trained in medical genetics at Guy’s Hospital in London before spending 12 years at the Sanger Centre (now the Wellcome Trust Sanger Institute). There, as Head of Human Genetics and working with director Sir John Sulston and colleagues, he helped set up the British arm of the Human Genome Project. In 2005, Bentley joined a British next-gen sequencing start-up called Solexa (having been an advisor since launch in 1998). Solexa had just sequenced the virus PhiX174 genome – the same genome Fred Sanger sequenced (also at Cambridge) 20 years earlier. In 2007, Illumina acquired Solexa, and has been reaping the rewards ever since. As VP and Chief Scientist, Bentley has steered the applications of Illumina’s sequencing platform in many directions in precision medicine. Here, he talks to Clinical OMICs Editor in Chief Chris Anderson about the company’s latest work with the 100,000 Genomes Project, Genomics England and the UK National Health Service, and more broadly about the role of genome sequence data in the precision medicine landscape. Are we reaching the end point with the 100,000 Genomes Project that you envisioned when you started with the Sanger Institute? How significant a project is it that the UK National Health Service (NHS) is embarking upon? Bentley: I think it’s a very bold and courageous move for healthcare for patients and Genomics England. The NHS really took the decisions to evaluate it some 4-5 years ago. The decision making was happening in August 2014, when we signed the contract to do the 100,000 genomes ourselves. The whole 100,000 Genomes Project is a pilot – an ambitious pilot – but it bit off both the challenge of reaching a large number of patients in the NHS who were involved and the challenge of doing the whole genome — going straight for the test that they believed was the long-term future for medical genetics. We took on the challenge of implementing the technology at scale and continued to develop it. We learned a lot, we continue to learn every time we have a collaboration or an interaction and this was a very strong partnership. This led us to work at scale going up to as many as 7,000 genomes a month, which has been our production. That brought us not only to learning how to make sure we produced a good genome every time, we could tell if something needed a bit more work on it to make it a good genome. But most parts of the genome are being routinely sequenced now, first time out of the gate. A high-quality genome is produced at the end of the process and sent to Genomics England. Genomics England took on the huge challenge of essentially engaging the country and the various medical centres and local hospitals and all the stakeholders. They also did a very good job of public outreach, because it was important to engage the public to understand, to have some of them come forward. They have had a very strong patient representation as part of the process. Quite a number of the patients have come forward and said how much it means to them. Former Prime Minister David Cameron started this. Was there any worry about Government support going forward? Bentley: You can never count on future government support. But I think the project has always carried universal appeal. All parties, any members of the government in one form or another will support the NHS and the future of healthcare. Running through that was a particularly strong ambition starting with Sir Malcolm Grant, the Chair of NHS England, on downwards to actually bring the NHS on a more up-to-date process, recognizing the field is moving rapidly and to actually make the NHS perhaps less conservative, more forward looking. That was really an overriding driver within the NHS at the leadership level and the Chief Medical Officer, Dame Sally Davies, and the Chief Scientist with NHS, Dame Sue Hill, Sir John Bell and others, all concerted in their drive towards looking at what the best thing to do for the long term was and securing that investment. Cameron was right there, ready to be persuaded, not the least having first-hand experience of course with his eldest son who had a rare genetic disease [infantile epilepsy]. That became one of the pilot conditions that we were examining as part of the evaluation. As this moves from a pilot phase into a transition phase that needs to provide sequencing at scale, what is Illumina’s ongoing commitment? Our role (at Illumina) going forward is to continue to refine and optimize and improve the genome sequencing technology. They (Genomics England) will continue to evolve the engagement within the NHS itself, the data management and the return of results. We’ve had a chance to work on those roles together and we get to continue to do that, which I think is a very wise move on the part of the NHS. We bring some level of increasing stability as we move into a full clinical test — we are fully ISO accredited, and so are Genomics England so that’s an important regulatory aspect; we certify every genome and continue to work on how best to extract the information and make a difference to patients both in rare disease and in cancer. Beyond what is happening in in the UK, will the NovaSeq be used in a clinical setting? Bentley: I think all of our instruments have worked well in research and previous instruments have gone into a clinical setting through certification, so I think they all work in both settings. It is important to have the research expertise of many people using our instruments and telling us how they work and giving us feedback. A bank of Illumina HiSeqXes fill research space at the Wellcome Sanger Institute in Hinxton, U.K. The NovaSeq, of course, is not yet in use with the 100,000 Genomes project. That is a consequence perhaps of the accreditation process, locking down a process and really repeating it—that level of standard high-quality delivery is still being done using the HiSeqX, which was designed, built and released just before the project started. The HiSeqX was very much an instrument developed with whole genomes in mind and that’s why it was the instrument pressed into service in 2014 when it came to starting the 100,000 Genomes Project. So that has remained the constant platform though the entire project. Is it too early to consider whether the NovaSeq will transition? Bentley: This year  we have been working to integrate the NovaSeq into the 100,000 Genomes project laboratory. This demands both proper evaluation and accreditation of the instrument for clinical use, which every lab has to do. It also involved integrating it into the processes, engineering the software that controls the fleet. It is a gradual process and we’re doing this over the year. 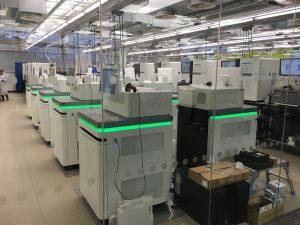 We do have several instruments in the lab in Hinxton [Genomics England’s sequencing centre], but it is not producing the 100,000 Genomes – the NovaSeqs are still going through the accreditation process and will be available for use [in 2019]. At that point we’ll continue to introduce NovaSeqs into the system so that NHS can benefit from the advantages of the NovaSeq genomes. Outside the clinical setting and having 55 million patients at their disposal, how does this play into the research feedback loop? Bentley: Genomics England has always recognized, along with NHS, the dual value to the patient and the clinical diagnosis, but there is also the value of accumulating the information and then, in a controlled way, making the information accessible for research and discovery. This in turn has a positive feedback on the future diagnoses of the patients, so that is already a process that is well recognized and is apparent within the 100K. Having access to the 55 million UK population ultimately provides an opportunity to grow that process, because clearly 100,000 is a good start — it is about 85K patients, because [you sequence] two genomes per cancer. There is a lot more that can be collected — more examples of conditions — and as the clinical records continue to document both the onset of conditions and their response to treatments there is a wealth of information in the larger population that will gradually fold into the same sort of process and allow researchers to access the medical information, alongside the genomic information, in a way that can rally stimulate much more research. Can Genomics England serve as a model for other countries that are looking to provide the same kind of service? Bentley: I don’t think one model fits all necessarily. This has been a very good model for the UK and the UK has provided a number of singular benefits of the NHS structure and how it has been organized, as a national, state-funded system; through to being a relatively small country, very well networked throughout the country and the government professions. [Other advantages are] a relatively small number of decision makers, a strong history in science as well as medicine, and the opportunity to create the company Genomics England PLC, which was solely dedicated to getting this project off the ground and nothing else. That is an important part of it. I can imagine in any country having a singular focus, who have people become experts in that space, the Genomics England example could be a useful model in any country. It won’t necessarily form in the same ways as with Genomics England, but there is always value in having a singular focus to get the job done and then to look at the opportunity to grow it… Other countries might have a different structure depending on the funding and the government structure and so on. Is there a strength in the UK for the companies and organizations that existed to help with the ramp up? Fast forward to the actual establishment of the sequencing facility itself at Hinxton on the Genome Campus. Our Hinxton laboratory is still a small part of Illumina; it is a model for being able to build others in the future. It shows that an efficient and self-contained organization is able to establish sequencing, and the model absolutely can be replicated in other centers, whether by Illumina or a local organization. The level of investment that was already here was tremendous in integrating into the research and medical community in the UK for a number of years, before we got to start this so that certainly benefitted us all as we established the 100,000 genomes project. Is there plenty of room to scale in Hinxton? 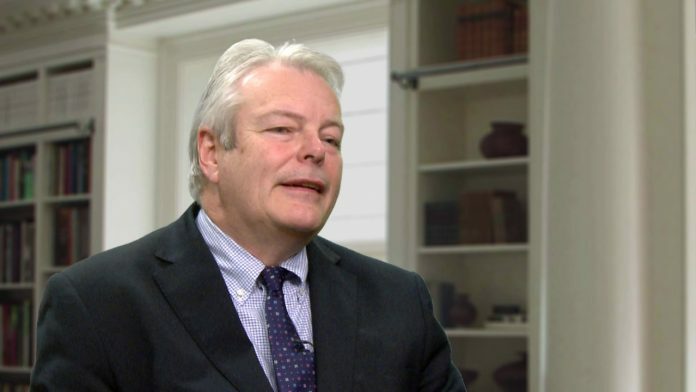 Bentley: If you extrapolate our capacity where we are at the moment, 6, 7, sometimes 8,000 genomes a month, that is close to the demand that the NHS has indicated going forward. On top of that of course the transition for the HiSeq to the NovaSeq is a significant jump in capacity, so we we have the opportunity to scale substantially to continue to meet NHS demands. What is the timeline for the transition to NovaSeq? We are looking to introduce some NovaSeqsstarting [in 2019]. It will be a gradual process because we need to keep the whole pipeline going. It is a gradual process of transitioning to NovaSeq from HiSeq. We can go faster or slower as demands dictate. We are validating using three instruments over there and we will continue to validate. The fleet can be grown or swapped in once we complete our milestone accreditation process which should be early . What potential roadblocks might Genomics England or the NHS encounter? Bentley: I don’t see any fundamental roadblocks. I think we’ve done enough to know – and it’s not just from Genomics England and NHS—we have seen a number of other initiatives both national and regional, in multiple countries, that are enthusiastically embracing the concept of whole genome sequencing in medicine. We have also seen tangible measurement of the value of the data in terms of accelerating diagnoses and saving costs in some areas where this has been evaluated. That work will continue to grow. In rare genetic disease, the evidence is more advanced than in cancer… Cancer is perhaps a more challenging condition in terms of the mutation spectra which actually lead to the disease. Nevertheless, in cancer, there is mounting evidence that whole genomes can make a difference as well. So not roadblocks, but challenges. Challenges converting the early evidential basis into formal structured evidence that will be required to support reimbursement, whether it is the US reimbursement system or the NHS adding these tests to their test directory. The NHS has not commissioned all types of cancer, they have commissioned the leukemias and pediatric cancers and sarcomas – so for every new cancer there has to be a period of evaluation before commissioning. Another challenge is that the entire medical field has to learn how to use the information. Perhaps the third one is data management. It is a large dataset. It is not an unmanageable dataset, but we need to learn how to manage it. It is also not a trivial matter? Bentley: it is not a trivial matter. The world is gearing up to much larger genomic datasets.. Whole genome sequences are at the high end of some of those datasets, but we are learning how to handle those data. The key thing is not that you suddenly have to look at a whole genome before you can make a diagnosis. The point is that the whole genome very likely contains the answer. You didn’t pick a series sequential tests, each asking a different question. Instead the whole genome sequence gets everything tested in one go, which is actually cost-effective, given the technology advances we have brought to the field. As a result, you have a much greater certainty the answer is in there. Finding it involves the process of interpretation, which all of us are finding out a lot more about how to do. The challenge is bringing a “big data” approach to then economically and quickly sift through the candidate causal mutation(s) to find the one or several candidates that matters to that patient. But also doing it in an affordable way? Bentley: There are clear indicators in the US and UK that the perceived value by those who are reimbursing or planning to reimburse for the test actually does match what we can achieve. The technology development can’t be underestimated – there has been a million-fold increase in the efficiency of sequencing in the last ten years. That does translate to a cost reduction and it does make genomes very accessible. We’ve come a long way in using genomic information but in a sense we’re only at the beginning. Where might we be in 5-10 years? Bentley: I won’t predict a timeline but the field always seems to make more progress than we think… I’ve experienced rapid advances and scale-up time and time again. It’s amazing what technology can do, when so many people are working so enthusiastically and capably at so many different levels. Some people are solving the sequencing, some are solving the chemistry, some the data analysis. Some people are trying to interpret the data, but everyone is doing it at the same time. The field moves very fast. You’re right, we have scratched the surface and other companies and organizations are moving forward. But the question is: how does this benefit not just 100,000 or not just the rare disease patients or not just the cancer patients but anybody in the population? It is worth reflecting — perhaps going back to our understanding of genomic information and how it relates to biology as a whole: Any individual may suffer a condition which may have some sort of genetic involvement, whether it is a disease, a reaction to a drug, or an autoimmune response. These are all rooted in a combination of genetic factors and the environment. The genetics can play an important part, the genome sequencing can provide the genetic information for any individual, no matter what is the medical or biological challenge. That is a rather general statement. Now if you map it to the population, between 7 and 10 percent of people will have some form of a rare genetic condition that would benefit from genetic information. Some serious conditions can have effective intervention today. Cancer has a 30 percent mortality, maybe higher. 50 percent of the population may get some form of cancer, so if you say that knowledge of both the germline mutations and somatic mutations make a difference, that is already a majority of the population that could benefit from the genome. Then you start to look at the more complex conditions, whether heart disease or diabetes, they have genetic factors that can be read from the genome. At ASHG  I was hearing about the advances in the analysis of polygenic risk factors in common disease… three years ago this field was much less advanced. It’s come a long way since then. In closing, is there anything else? Bentley: It is important to recognize that it is a controlled way forward. People are looking carefully at the impact from all sorts of points view, from ethical to social/legal as well as the ability to accurately, safely intervene to bring genomics into the rest of medicine and bring it into the existing medical infrastructure by which a doctor cares for a patient… the field of clinical genetics has provided many lessons and established the rules for use of genetic information in medicine; and these principles can be applied equally to genomics. Genome sequencing can be considered just another test, and doctors will understand another test, learn how to use it, and bring it onboard. It will simply help inform their decision alongside the rest of medicine. It should not be over-interpreted, it is not a panacea for everything. It does not replace everything else, it simply works alongside everything else. I believe there is a growing bond between the medical profession and genomic technology.